When I met up with Jerry Garcia for a PM Magazine TV interview in a NY hotel room in late Fall 1984, the Grateful Dead were about to celebrate their 20th anniversary. The band had already begun to attract a second generation of Deadheads — extremely loyal fans who may have been too young to experience the 60’s firsthand, but were determined to embrace the experience in every way possible. Jerry was in town to play a show with John Kahn at the nearby Capitol Theatre in Passaic, NJ. It was just one of several side projects he would often pursue. Relaxed and happy, it was surprising and sad when just a few months later he entered a difficult period that lasted nearly two years plagued by drug and health issues. Happily he and the band recovered to record 1987’s In the Dark, the album that would provide them with their first (and only) Top 10 single “Touch of Grey” (and the introduction of Cherry Garcia ice cream). “The long strange trip” would continue for almost eight more years until his untimely death in August 1995. My first Dead working experience (not just as a listener) was as part of a historic broadcast on December 5, 1971, from New York’s Felt Forum a mid-sized theatre within Madison Square Garden. 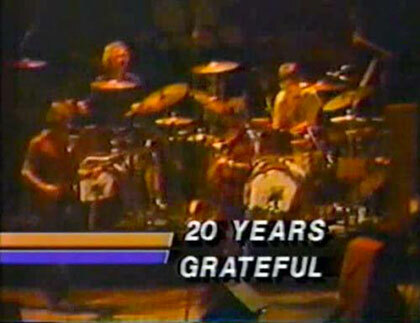 As was often the case that year, The New Riders of the Purple Sage were the opening act for the Grateful Dead. A Bill Graham production, it was the first live radio broadcast of the Dead in New York City and one of their earliest ever. We had the broadcast at 102.7 WNEW-FM and as the new kid on the staff, I was back at the studio to handle the station ID’s and be ready in case anything went wrong. In his role as Program Director, the legendary Scott Muni outlines the evening’s events as they are expected to unfold in this wonderful memo.